Corn flour can be the main ingredient in corn muffins or corn bread or a thickener in gravies or chowders; it's also a variation on the wheat flour in regular recipes. The nutritional values for white and yellow corn flour are similar, and either one can be part of a balanced diet. Corn flour is healthiest when you consume it in moderation along with nutrient-dense foods. A cup of enriched yellow corn flour has 416 calories and 4.4 grams of total fat, with almost no saturated fat. It has 11 grams of protein and 89 grams of total carbohydrates, including 75 grams of starches. This amount of the flour provides 7.3 grams of dietary fiber, which can help lower your cholesterol levels and may reduce your risk of constipation. 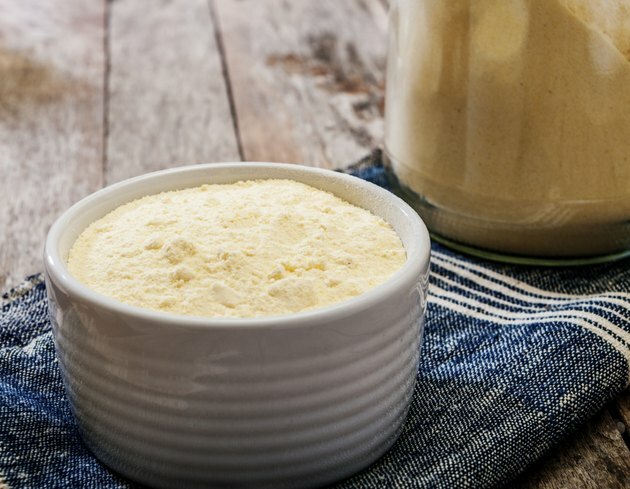 Corn flour is cholesterol free and a source of the phytonutrients and antioxidants called lutein and zeaxanthin, according to the Linus Pauling Institute Micronutrient Information Center. Some of the nutrients are lost from whole grains during the refinement process; and enriched grains, such as enriched corn flour, have some nutrients added back in so that the final product contains at least as much as the original whole grain. Enriched grains must contain high levels of thiamin or vitamin B-1, riboflavin or vitamin B-2, niacin or vitamin B-3, folate and iron, according to the 2010 Dietary Guidelines from the U.S. Department of Health and Human Services. A cup of enriched corn flour has 9 milligrams of iron, 1.8 milligrams of thiamin, 0.9 milligrams of riboflavin, 11 milligrams of niacin and 238 micrograms of folate, or at least half the daily value for these nutrients. Corn flour is naturally low in sodium, with 6 milligrams in a cup of enriched yellow corn flour. A low-sodium diet can help prevent high blood pressure or help you lower your blood pressure if you already have hypertension. The recommendation is for healthy adults to have no more than 2,300 milligrams sodium and for hypertensive individuals to stick to 1,500 milligrams per day. Magnesium and potassium are necessary for regulating blood pressure, and a cup of enriched yellow corn flour has 106 milligrams of magnesium, or 27 percent of the daily value specified for healthy adults in the 2010 Dietary Guidelines for Americans, as well as 300 milligrams potassium, or nearly 8 percent of the minimum of 4,700 milligrams of potassium per day. Selenium is a mineral that promotes the antioxidant activity of vitamins C and E in your body, and the flour has 16 milligrams of selenium, or 23 percent of the daily value.